We invite you to browse our Frequently Asked Questions below, or if you don’t see your question listed please call us at (928) 925-4550 or send us an email from our contact page and we’ll get right back to you! For even more information about Sea Eagle boats check out the Sea Eagle Youtube Channel. Can I Fly Commercial Airlines With My Sea Eagle Kayak? One question that comes up from time to time is can I fly commercial airlines with my Sea Eagle kayak. The customer below describes how he handled one of our largest and heaviest kayaks the Sea Eagle 420. 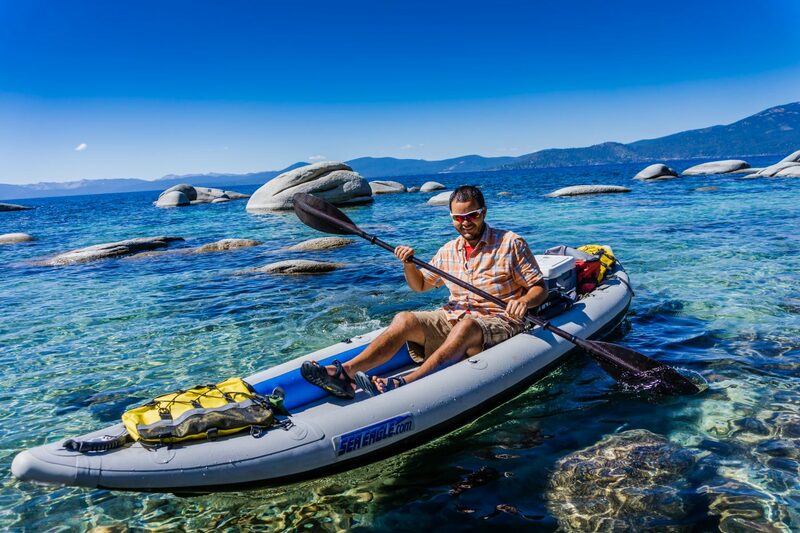 In case you’re curious our most packable kayak is our Sea Eagle FastTrack. A quick note to tell you about our experience taking our Sea Eagle Explorer 420x Kayak on our recent trip from Denver to Florida. It was really quite painless. We simply rolled up the kayak and seats and placed them in the storage bag that comes with the kayak. I tied the carry straps on the kayak bag together with a double overhand knot so that the straps weren’t hanging loose. The paddles, pump, and life vests were packed into a large suitcase. We completely disassembled each paddle into four parts (two plastic paddle blades and two-piece aluminum handle) to get them to fit diagonally into the suitcase. To transport the bagged kayak to the baggage check-in/ticket counter, I strapped it on to a fold-up luggage dolly. Once at the counter, I unstrapped the kayak bag from the fold-up dolly and placed the dolly in the suitcase with the paddles, life jackets, etc. Both the kayak bag and the suitcase were well within the 50 lbs luggage weight limit and both “flew free” on Southwest Airlines. When we arrived in Florida, we picked everything up at luggage claim at the airport, took the dolly out of the suitcase, and strapped the kayak bag on to the dolly for the trip to the rental car. Rinse and repeat for the return flight after a great time kayaking in south Florida. Try doing that with a hard-sided kayak! Myth: Inflatable kayaks can’t eskimo roll. If I fall out, I won’t be able to get back in. Cabin Fever has set in and questions are pouring in from snow-bound fishermen looking ahead to spring. The #1 question? What size trolling motor do I need for my new Sea Eagle Inflatable Boat? With motor-mounts now available for most of our kayaks and all of our fishing boats here are are some Tips I’d like to pass on. Tips learned over the last 15 years of motoring with Electric Power on the back of my Sea Eagle kayak. Deluxe or Pro? Which Package Should I Order? I know..! I know..! You’ve done your research and you’re itchin’ to order a Sea Eagle kayak. Either a Sea Eagle FastTrack or maybe the Sea Eagle Explorer or a Sea Eagle PaddleSki kayak. Possibly even a Sea Eagle 330 or 370 but now you’re wondering which seat is the most comfortable and the least hassle. When Crystal and I use any Sea Eagle kayak we choose the option group the includes the inflatable Deluxe Kayak Seat as shown in this picture Here’s why……. It’s all about the seats! Sea Eagle has two option groups for the Sea Eagle FastTrack, Explorer, or PaddleSki Premium Kayaks. The entry level Deluxe Option Package includes two Deluxe Kayak Seats while the Sea Eagle Pro Option Package includes black Tall Back Seats. The Tall Back Seats found in the Pro Option Package provide roughly the same back support as the grey inflatable Deluxe Kayak Seat but are difficult to rig and and prone to collapse if not rigged correctly. We use and recommend the less expensive, and softer, Deluxe Kayak Seat. We also feel the paddles offered in both Deluxe and Pro Premium Level Kayaks to be a push in spite of the advertising hype. The Bow and Stern kayaks bags included in Pro Options Groups are not waterproof stow-bags and smallish. You’ll need some waterproof dry bags anyway so save your money and buy the Deluxe Option Package! But I’m ordering A Sea Eagle 330 or maybe a 370 Sport Kayak. Which option Group should I choose? Now it gets a little confusing so stay with me. When Crystal and I use a Sea Eagle 330 or 370 kayak we choose the Pro Package. Here’s why……. It’s still about all the seats! Sea Eagle has two option groups for the Sea Eagle 330 and 370 Kayaks. The entry level Deluxe option package includes two SEC Canoe Seats while the Sea Eagle 330/370 Pro option group includes these new Jet-Boat Bucket Seat (Sea Eagle calls them Deluxe Kayak Seats to confuse you). The SEC Canoes Seats found in the Deluxe Option package provide very little back support. We would never consider a day on the water with the SEC Canoe Seats. Buy the comfort..buy the Pro package with the Deluxe Kayak Seats! We really like these DKS Seats for all our kayaks. Ordering a Sea Eagle FastTrack, Sea Eagle Explorer, or Sea Eagle Paddle Ski? Order the Deluxe Package. You can even use the Deluxe Kayak Seat on the beach as Crystal (in pink) and Connie discovered. Can I Take the BTP Two Stage Electric Pump on the Airplane? We received a question the other day about whether or not it was going to be okay to take the BTP Two Stage Electric Pump on the airplane. Would you be randomly selected for search? Would they make you throw your precious electric pump away? Or worse – would they throw you off the plane and ban you from the airport altogether? Okay, we added the last one in for dramatic effect. By now, you probably know that you can travel with just about any inflatable kayak, boat, SUPs, etc. when you fly. Even out of they country! That’s the beauty in these truly packable and portable boats. Yes! You can absolutely pack your electric bump without the battery without worrying about being tackled by TSA. So fish on, amigos! I Found the Same Product Cheaper on Another Site – Will You Price Match? Yes! We will always price match and we’re thrilled that you want to shop with us! Will You Ship Outside of the U.S? Unfortunately, we can not. We ship anywhere in the United States. If you’d like to purchase a boat outside of the U.S, check out Sea Eagle’s list of authorized international dealers. All inflatable boats, kayaks, paddle boards, and accessories are brand new. Why Are You Cheaper Than the Manufacturer? We’re a ‘Mom and Pop’ online retailer authorized to sell Sea Eagle inflatable boats, kayaks, and stand up paddleboards. We’re able to offer reduced prices to our customers because we don’t have major overhead expenses like payroll, inventory, employee benefits, etc. Sea Eagle offers us products at wholesale prices to extend their reach and minimize their overhead, while delivering their trusted, quality product to customers across the globe. It’s a win-win-win! Will I Get the Same 3-Year Warranty? Yes! The same 3-year warranty for your Sea Eagle boat is still extended. If you purchase through us and have a warranty issue, just contact us directly and we’ll get it all straightened out for you. Take a look at our Warranty page to read more. Do you have a question about our company or the Sea Eagle boats we sell? Check out the top questions most customers ask us below to see if we can help you out! If you can’t find the answer you’re looking for, we’re available via LiveChat, or you can fill out our Contact Form and we’ll get back to you shortly.